LAST WEEKEND WAS the annual Journées du Patrimoine, the wonderful weekend in September when it’s possible to visit a wide variety of well-known but usually off-limits places in Paris and indeed in the rest of France. Places like the Elysées Palace, the French Senate, or the Assemblée Nationale as well as a wide variety of theatres, museums, historical monuments and public buildings open their doors to the public for this weekend in September and entry is free. Even my local mayor opened up his office and was there to greet visitors from my neck of the woods as they passed through. 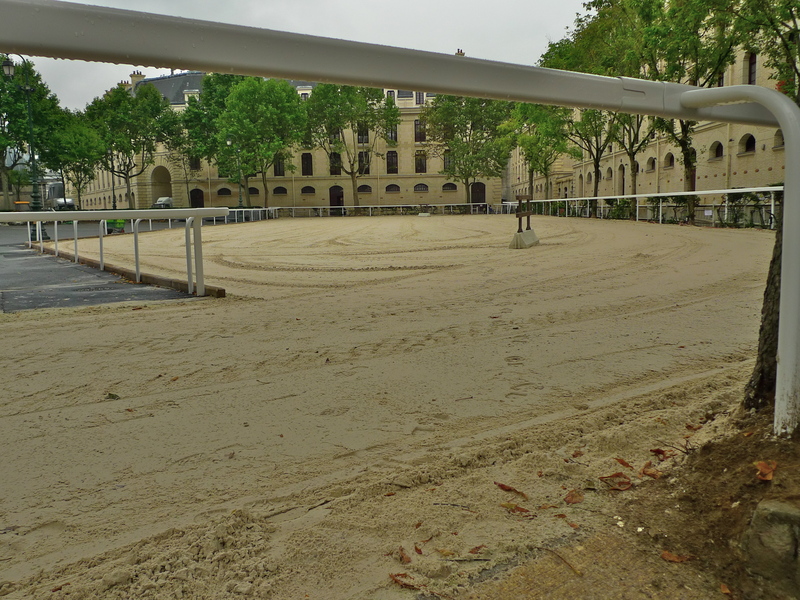 I went here to the Quartier des Célestins the home of the cavalry regiment of the Garde Républicaine. 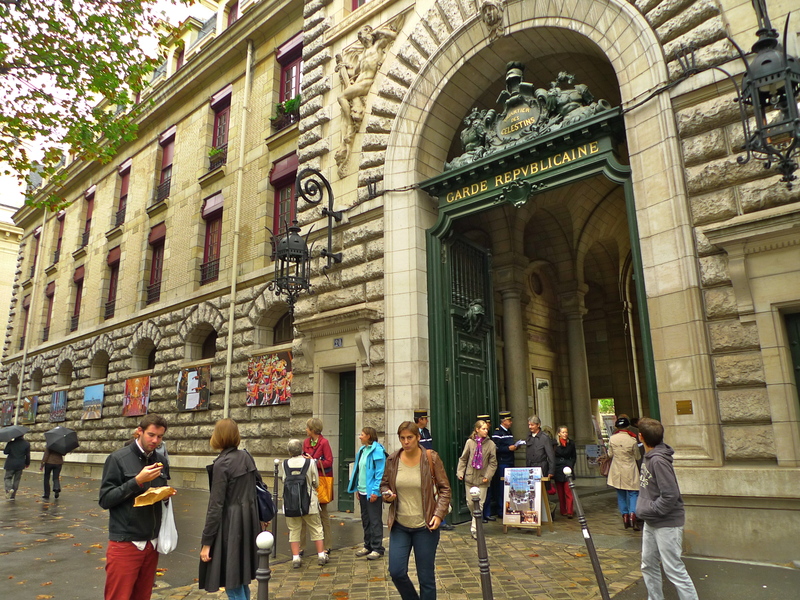 The barracks occupy a rather grand building on Boulevard Henry IV in the 4th arrondissement, a short walk from Bastille. It’s called the Quartier des Célestins because it stands of the site of the former Couvent des Célestins, the Convent of the Celestines. Philip the Fair introduced the Celestines into France in 1300 and the convent was built in 1352 on the site of what was a former Carmelite convent. The convent was closely associated the French Royal family and it became the second most important burial site for royalty after the Basilique Saint-Denis, albeit for minor Royals. By the 18th century the convent was in decline and it’s demise came in 1778. 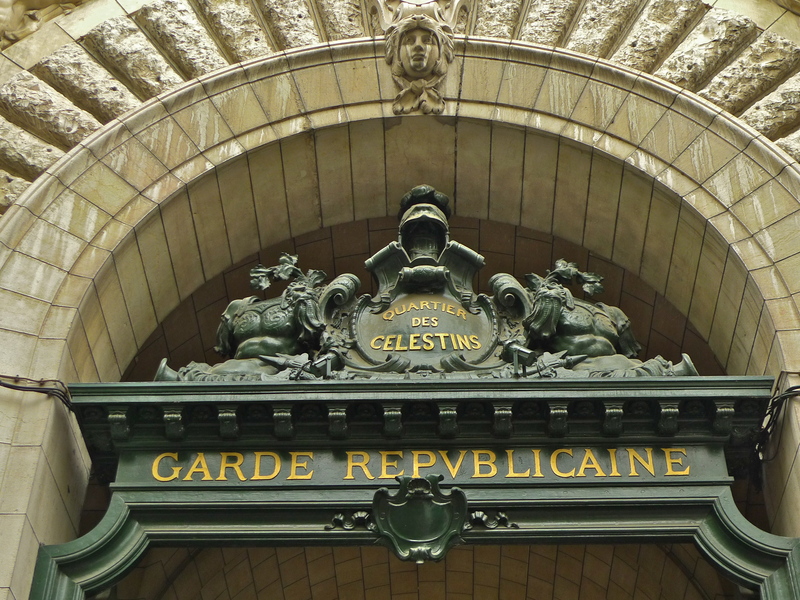 The buildings were demolished in 1847 and the Célestins barracks of the Garde Républicaine, designed by French architect Jacques Hermant, was built on the site of the convent gardens and opened in 1901. 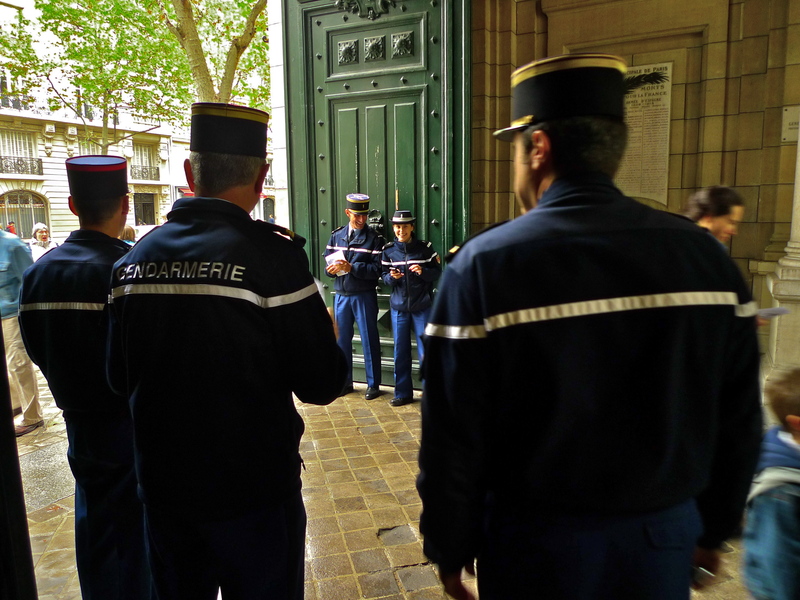 The Garde Républicaine, formed in 1802 by Napoleon Bonaparte as the Municipal Guard of Paris, is part of the French Gendarmerie. Today, it comprises two infantry regiments, including a motorcycle squadron, and a cavalry regiment. 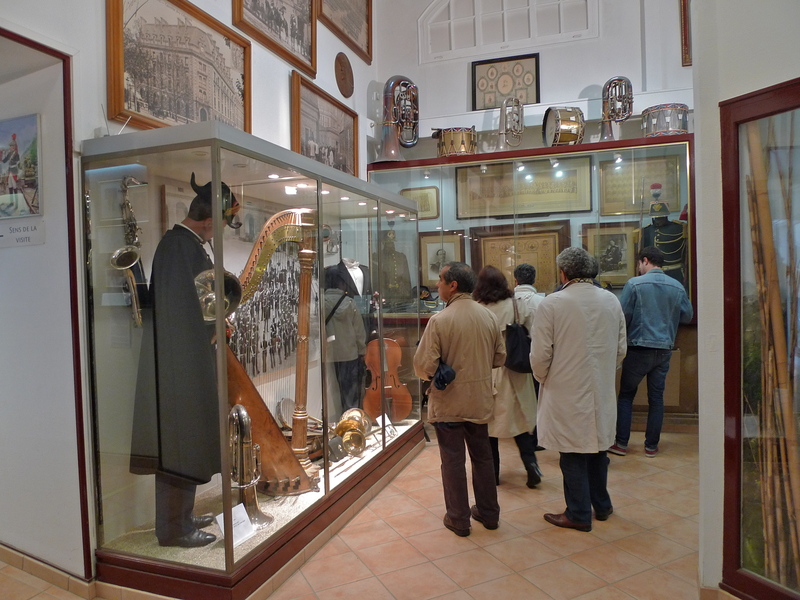 It also has several musical formations including a mounted band and fanfare trumpeters as well as an eighty – piece orchestra. 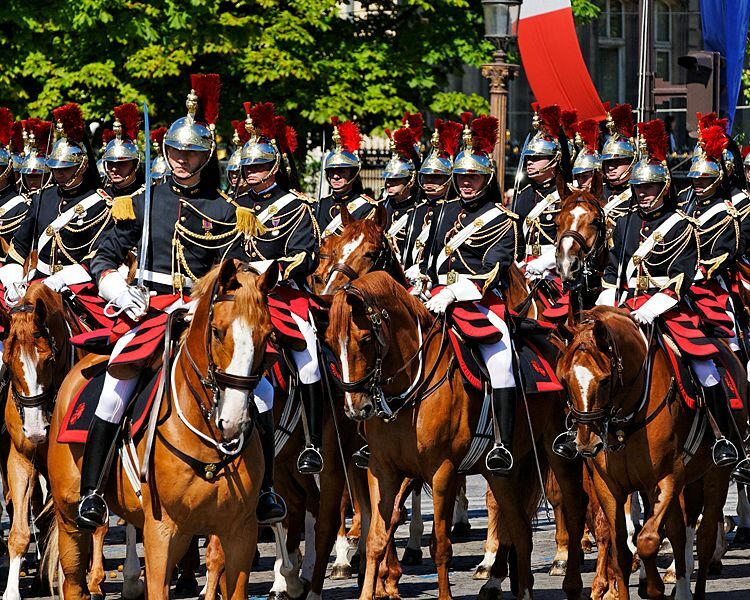 As well as it’s State ceremonial duties, including representing France at international events abroad and receiving important dignitaries at home, the Garde Républicaine is responsible for guarding important public buildings and supporting other law enforcement forces with intervention groups or horseback patrols. It also has responsibility for transporting and escorting organs for transplant. 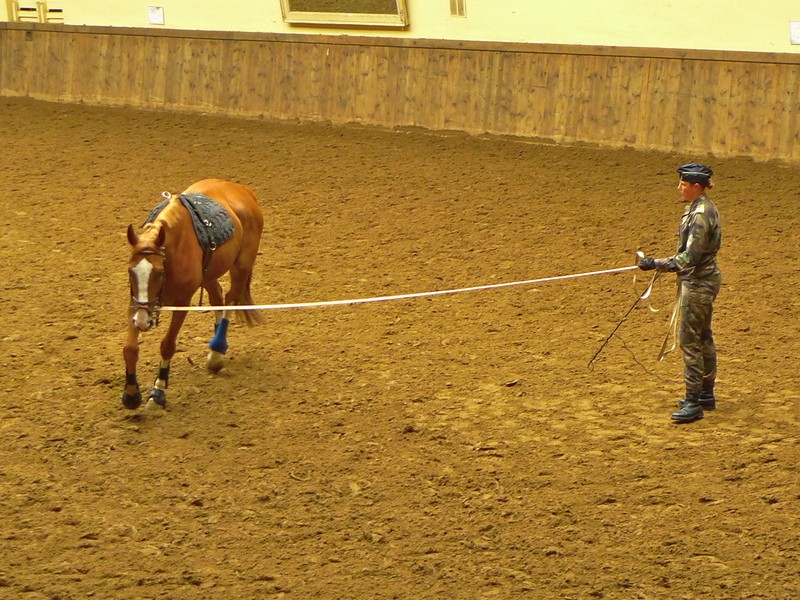 The cavalry regiment of the Garde Républicaine is the last unit in the French Army to have horses. It comprises around 500 men and women along with some 550 horses. 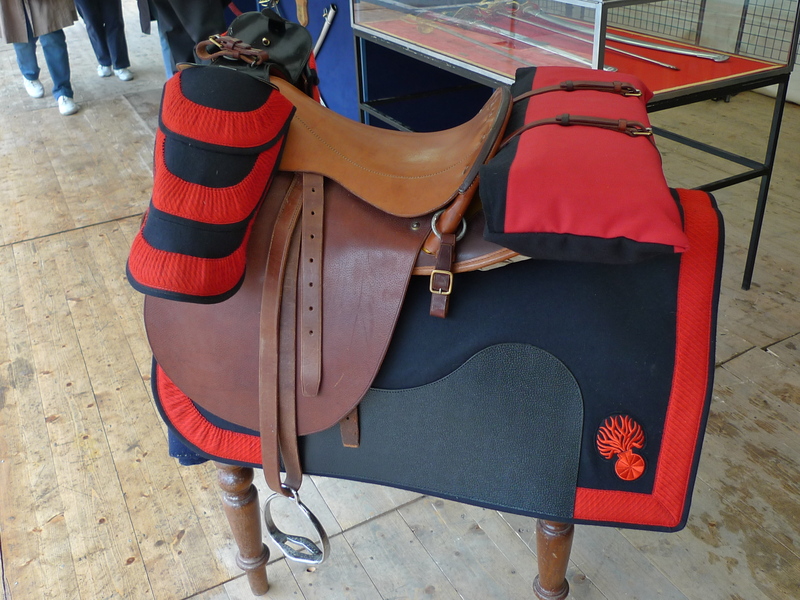 The regiment includes a training school based at Saint-Germain-en-Laye, three squadrons of cavalry, one of which is based at the Quartier des Célestins and a squadron hors rang, also based at the Quartier des Célestins, which includes the musicians, farriers and veterinary services . 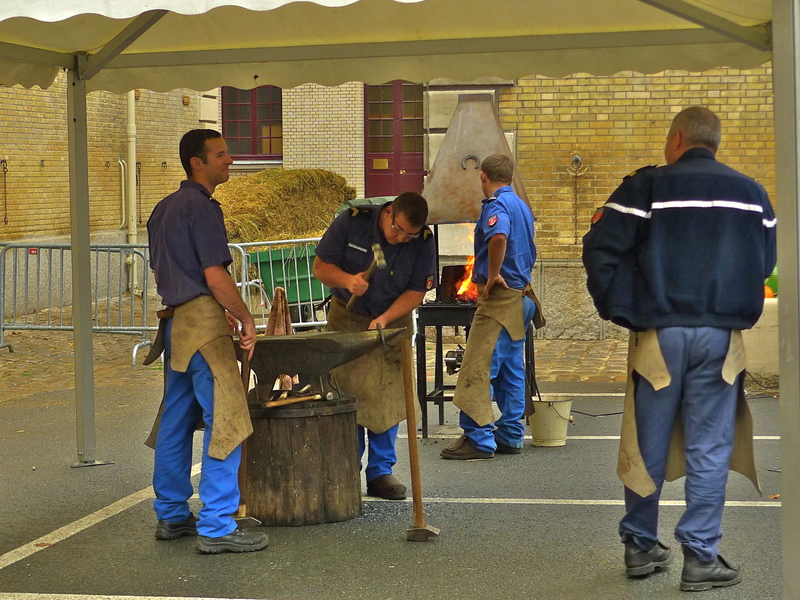 Passing through the cluster of rather burly but not at all unfriendly Gendarmerie at the main gate, my first port of call was the Salle de Traditions, the museum. 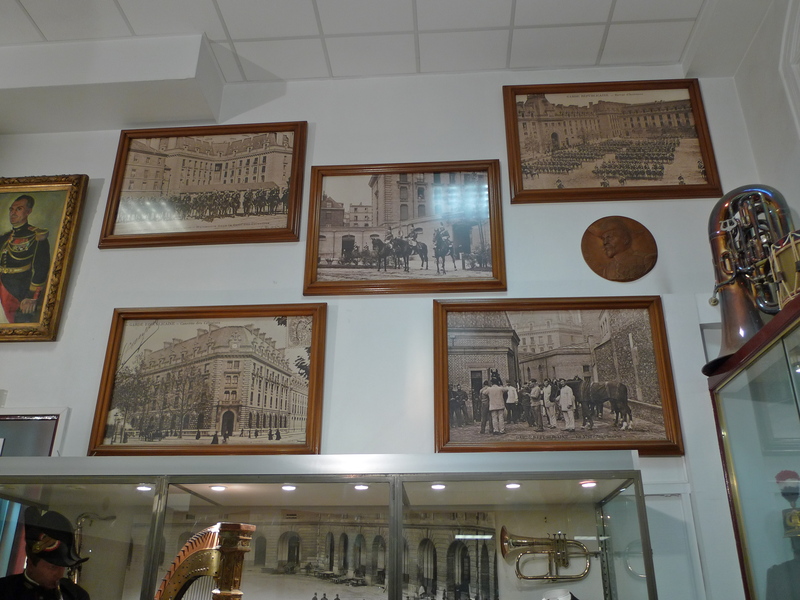 It’s a small museum but I found it really fascinating. 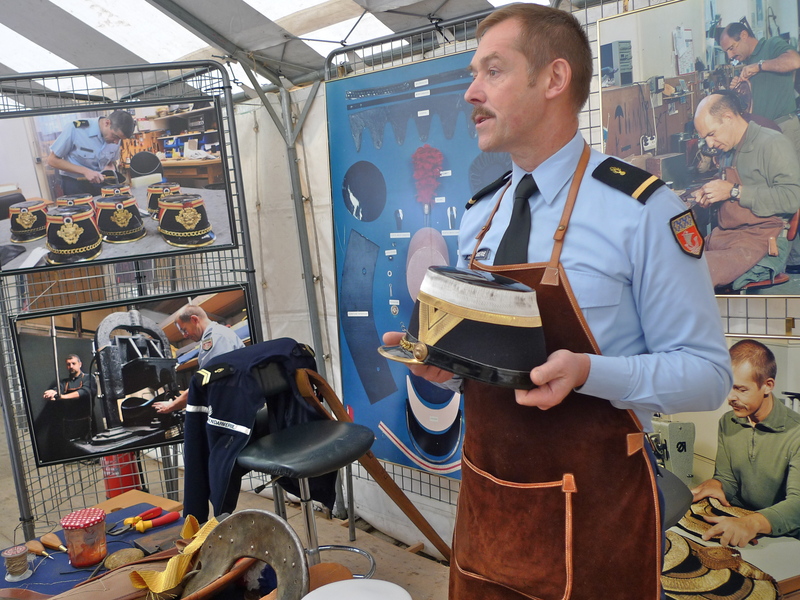 It covers the history of the Garde Républicaine from its inception to the present day and it includes an array of exhibits covering every aspect of the life and work of the regiment both from its service at home and overseas. 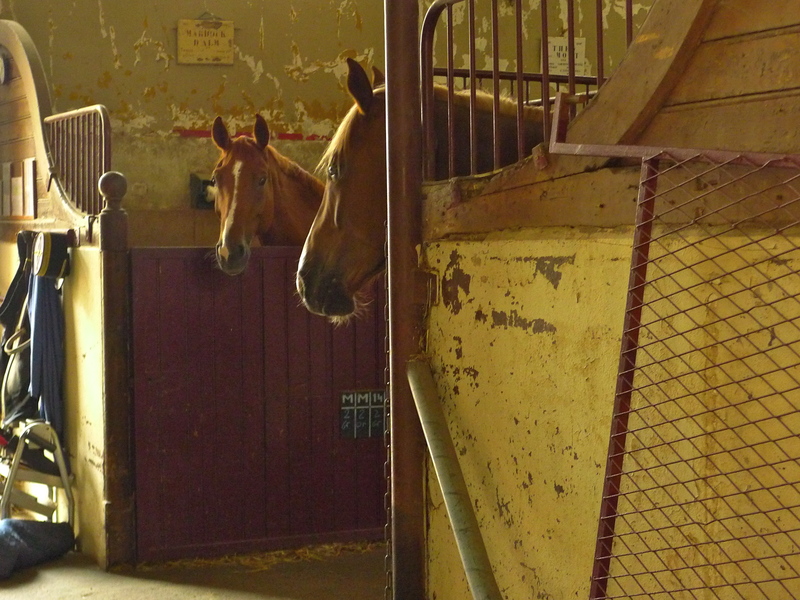 From the museum, I walked to the exercise yard – this is a cavalry barracks after all and horses need plenty of exercise. 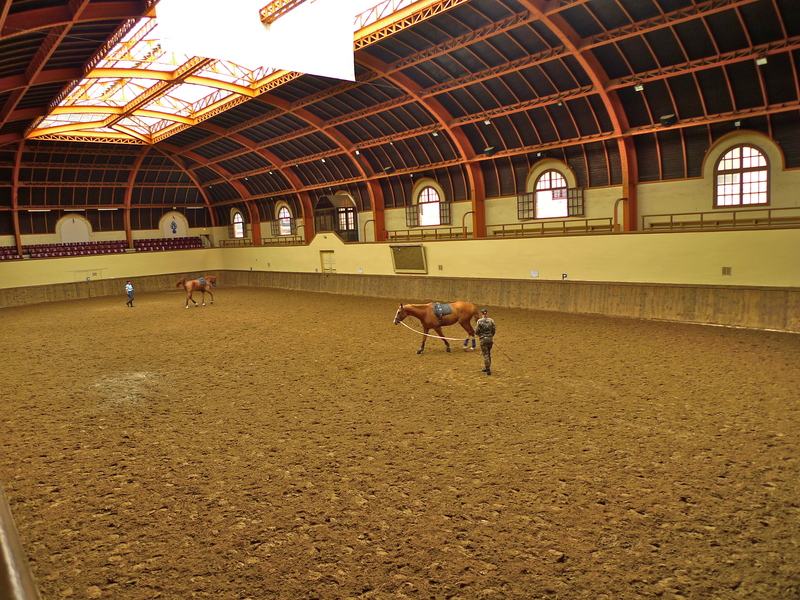 … and the enormous riding school. I never go anywhere without my sound recorder and I’m always on the hunt for fascinating sounds to capture. 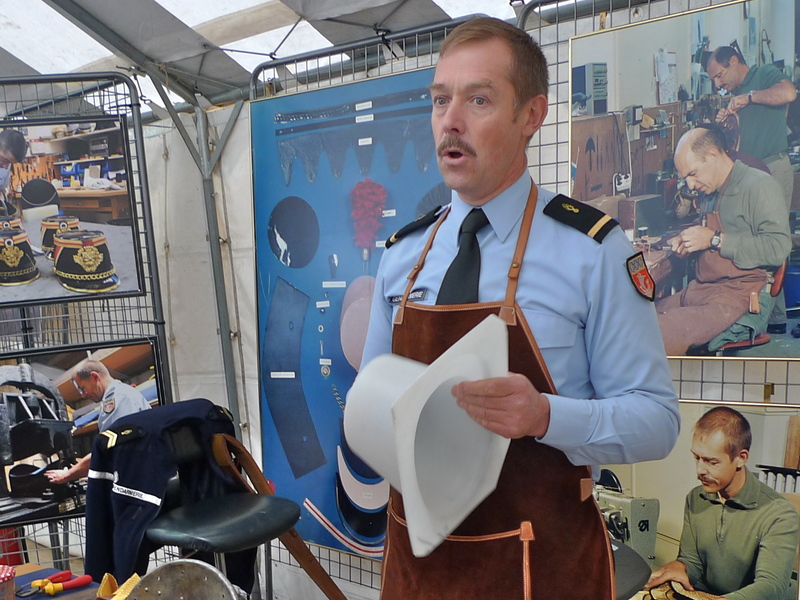 I did record the sounds inside the museum and in the riding school and later on I recorded the man responsible for making the hats for the infantry regiments of the Garde Républicaine explaining how it’s done. 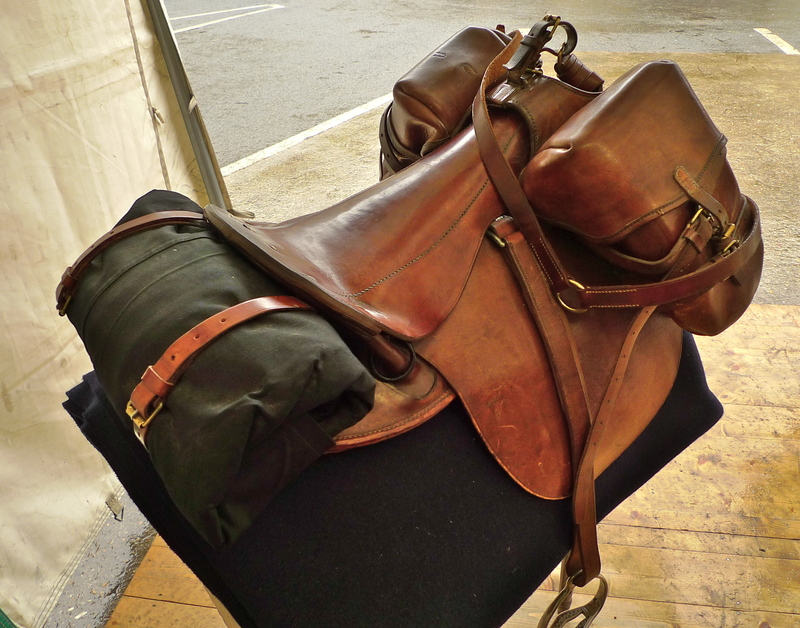 But the sounds I want to share with you are sounds that tell a story – the sounds of the farriers at work shoeing a cavalry horse. 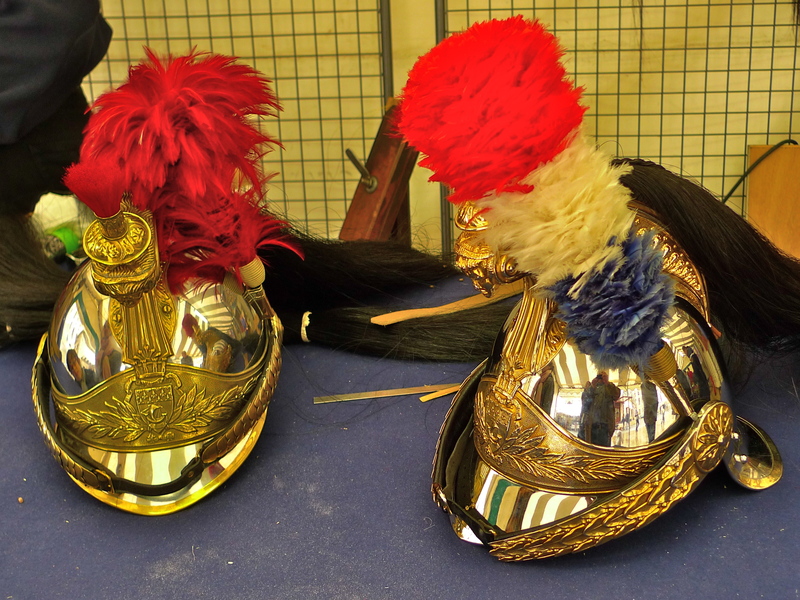 The first thing you need to shoe a horse is a horseshoe, a fer à cheval in French, and the Garde Républicaine make their own – lots of them. 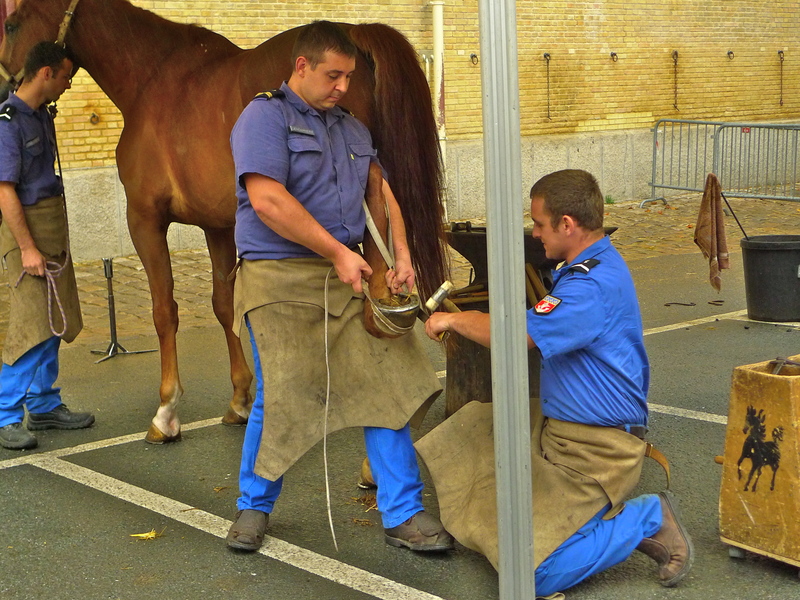 Once the horseshoe is made to approximately the right size the process of shoeing the horse can begin. Here are the sounds of the entire process which I recorded standing in the rain sans umbrella amidst a group of inquisitive children who were fascinated by it all. 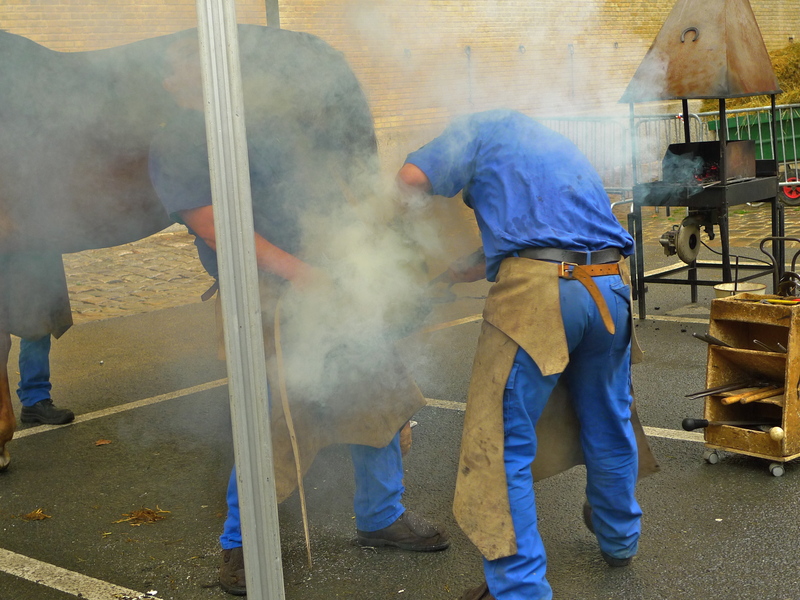 Then you have to tidy up the horse’s hoof with lots of scraping and filing. 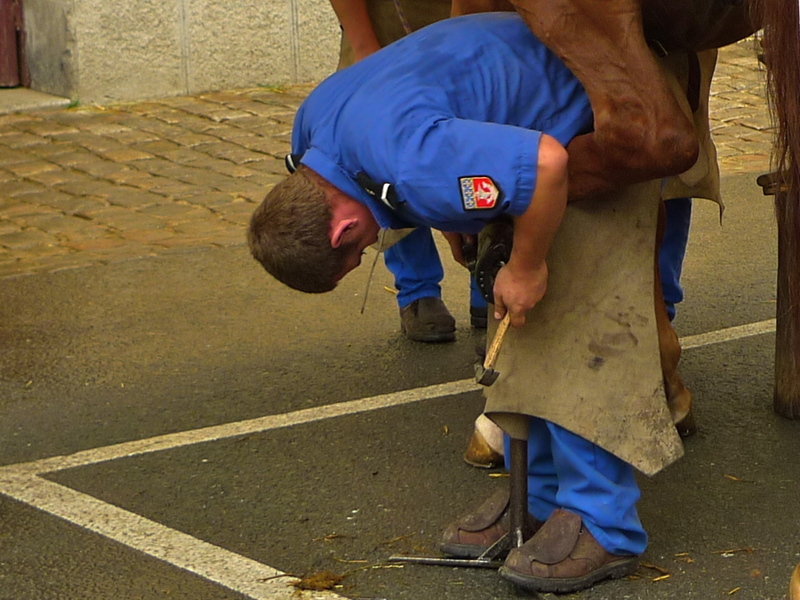 Next, you present the new shoe to the hoof and see what adjustments need to be made to ensure an exact fit. 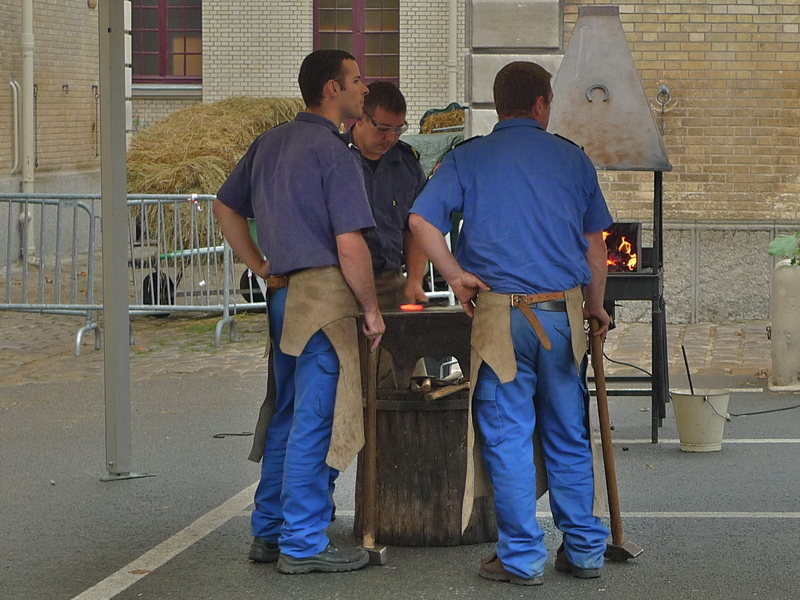 This involves heating the shoe in the forge and then shaping it by hitting it with a hammer. Once the shoe is tailored to the right size it’s edges, in the best military tradition, are ground down to make them bright and shiny. 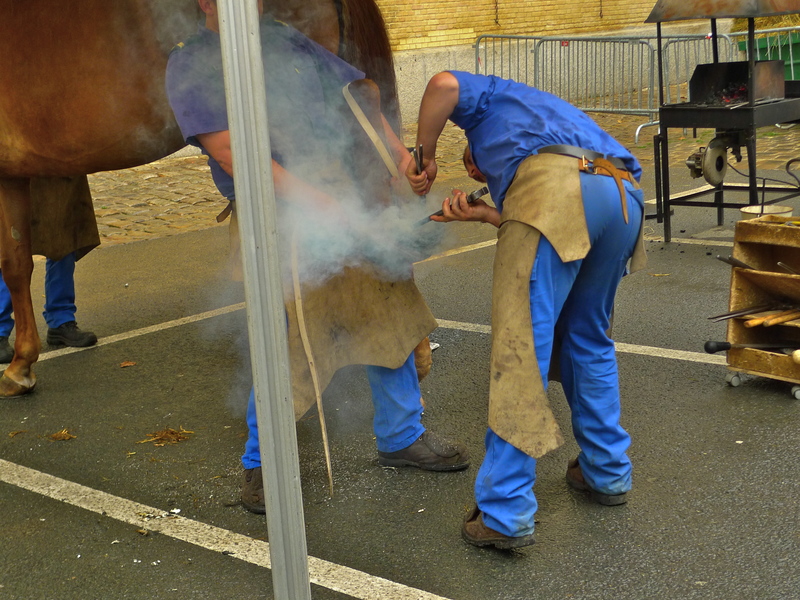 The shoe is then heated again and presented to the horse’s hoof while the shoe is still hot. It’s a very steamy process! Once the shoe is fitted, special nails are hammered in to fix the shoe in place. The points of these nails penetrate the hoof and come out the other side. Some of the exposed parts of the nails are pinched off and then a clinch block is set under each nail on the outer hoof wall and the nail head is hit with yet another hammer and the nail is set into the hoof. 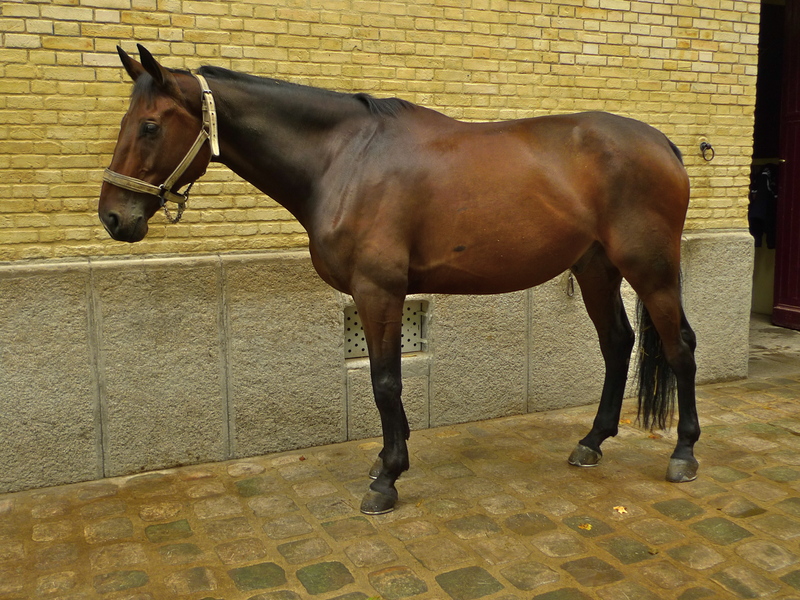 All that remains is a final pedicure and the horse is good to go to a round of applause. 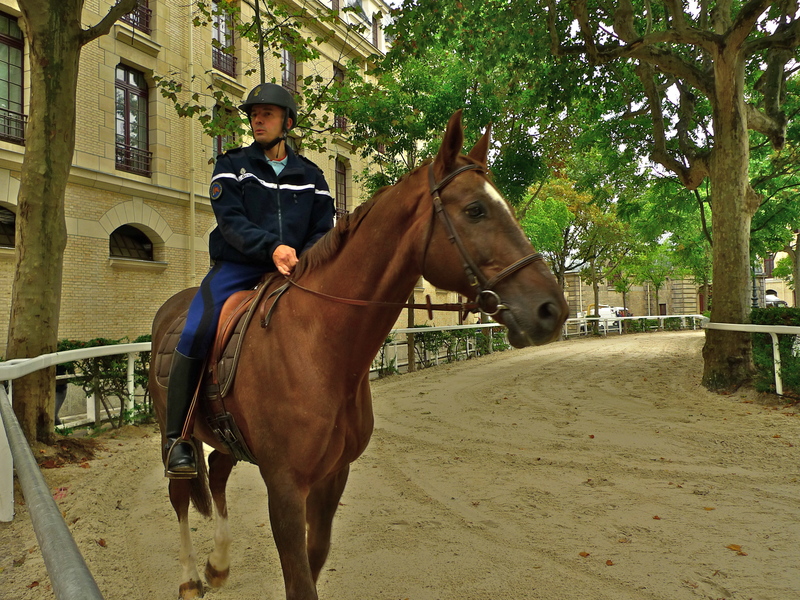 I didn’t know any of this until my visit to the Quartier des Célestins. 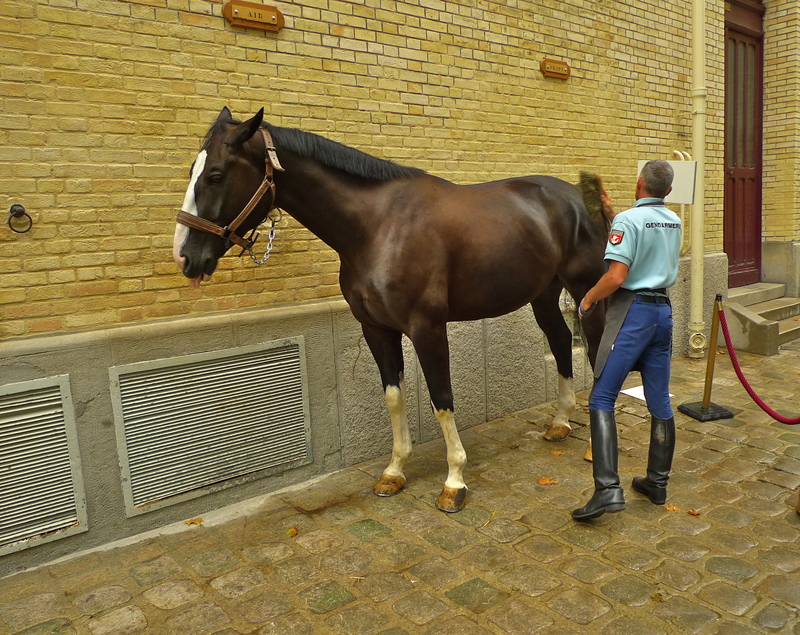 I’d never seen a horse being shod before so not only did I learn a lot, I also recorded it for posterity – and it made my day. 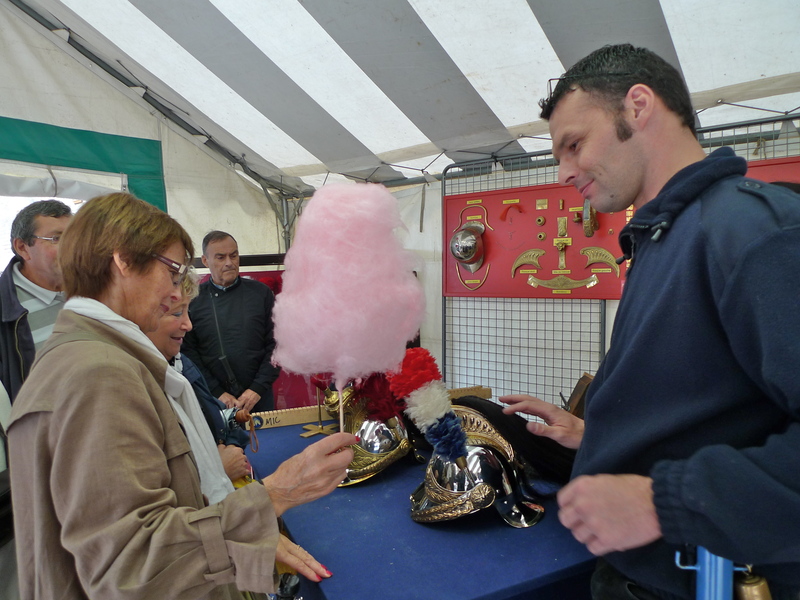 I’m sorry madam, candyfloss does not pass muster as a cavalry plume!